1 By moving the launching point out to sea the likelihood of a preemptive attack by enemy ICBMs is reduced. 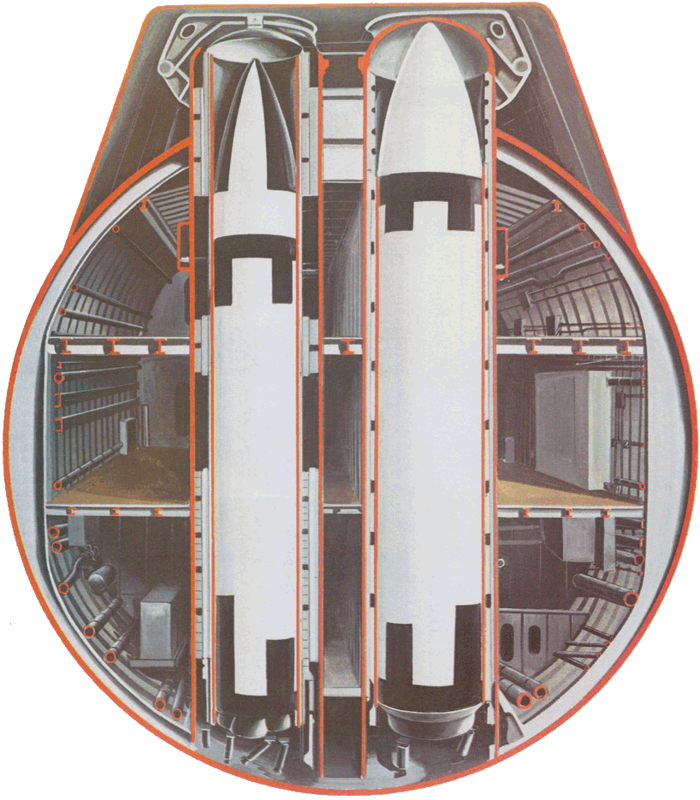 2 Since the furthest point on land is only about 1,700 miles from the sea, the Polaris missile needs much less fuel than ICBMs, and can be smaller. 3 The difficulty of finding submarines in the oceans of the world means that in the foreseeable future there is no counter-measure. Polaris works on a very simple principle of physics, the fact that water is incom pressible; a missile is ejected from the submarine by gas or steam, its rocket motor ignites as it leaves the water, and the resulting downblast uses the "hard" water underneath as a launching pad. One major problem had to be solved before the Polaris system could be made to work, that of navigation. As a nuclear submarine dare not surface frequently to check her position by star-sights or radio- fixes, prolonged submarine voyages demand a much higher standard of navigation than ever before. The answer came in the SINS, the Ship's Inertial Navigation System, basically a computerised method of checking the vessel's actual movement from her point of departure by means of accelerometers and gyroscopes. With SINS to track all drift and movement a nuclear submarine can dispense with magnetic compasses and dead reckoning errors, which makes a journey under the North Polar ice cap feasible. Furthermore, since a Polaris missile needs to know the distance to its target, it can be updated constantly by a fire control computer adjusting the firing trajectory from data provided by SINS. Another problem created by Polaris and nuclear propulsion was habitability. If maximum benefit was to be gained from a submarine with virtually unlimited endurance, the human element had to be catered for. Intensive research into ventilation systems showed that it might be possible to extend a submarine's submerged endurance to three months or more by recycling the air - in other words, making the crew breathe their own air after it had been refreshed with oxygen and "scrubbed" to remove toxic gases. Many interesting points came to light, particularly the need to have paints which did not give off toxic vapours, but now nuclear submarines are limited only by the endurance of their crews. This gives the submarine the same advantage that used to be enjoyed by the sailing ship - independence of bases as long as the food and water last. The accumulation of waste causes severe problems as a hundred men will account for a large amount of potato peelings: the latest submarines are big, but they do not have unlimited space, and it is not always safe to jettison rubbish. For the same reason modern submarines have self-contained sewage systems which are pumped out when they return to base; this is also necessary because the pressure at great depths makes flushing the "head" too difficult. Because of the extended cruise period, colours of furniture and furnishings have to be brighter and more harmonious than they were, especially as they are always seen by artificial light. Fortunately their great size allows nuclear submarines to have three decks, and so the accommodation can be made spacious. Crew comfort helps to reduce the strain of long patrols, but it is also necessary to provide films and gymnastic apparatus to combat boredom and the lack of exercise.